Multiple 2018 stakes winner SF Hot Pass will head Saturday’s 400-yard, $25,000 B.F. Phillips Jr. Stakes (R) for Texas-breds at Lone Star Park. GRAND PRAIRIE, TX—NOVEMBER 1, 2018—SF Hot Pass, a 5-year-old Ivory James gelding owned by Shannon “Stormy” Fisher, will risk his three-race win streak in Saturday’s 400-yard, $25,000 B.F. Phillips Jr. Stakes (R) for Texas-breds at Lone Star Park. SF Hot Pass will be shortening in distance off of his head victory in the 440-yard, $75,000 Refrigerator Stakes (G1) at Lone Star on October 13. The 9-5 morning-line favorite, the gelding drew post 4 and will be ridden by Francisco Calderon for trainer Leon Bard. Rogelio Marquez Jr.’s The Golden Bowl, a 6-year-old Mr Eye Opener stallion trained by Fernando Lopez, drew post 7 and will be ridden by Jesse Levario. The Golden Bowl will be stretching out in distance off of his second-place finish, a neck behind winner SF Hot Pass, in the 350-yard, $20,000 Nevill Stakes (R) at Lone Star Park on September 29. 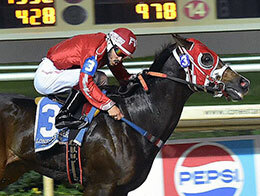 All Lone Star Park races can be seen at Q-RacingVideo.com.